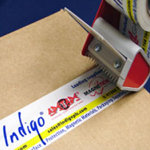 Why buy your printed tape from Indigo? Quality of Printed Parcel and Packaging Tapes varies greatly from one printer to another, the poor companies will produce your tape with print which is slighly smudged lookin, where as we use the the latest technology to produce outstanding sharp print results every time. We offer a range of quantity discounts to help you gain the very best prices possible, plus free block & artwork is available on higher quantities as an additional saving opportunity! We can supply any width, our most popular size of Printed Parcel and Packaging Tape which is 50mm (often 48mm) wide x 66m long (fits tape guns) we can however produce printed tape in widths 12mm, 19mm, 25mm, 30mm, 38mm, 75mm, 100mm and 150mm and lengths 132m, 660m and 990m and in standard Polyprop (polypropylene), Low Noise and Vinyl PVC grades. I want to place an order, what do i do?